1. Heat the grill to high. Place the fish skin-side down on a foil-lined baking sheet and season. Grill for 15 minutes until cooked. Remove the skin. Boil the beans for 5 minutes, cool, then remove their skins. 2. 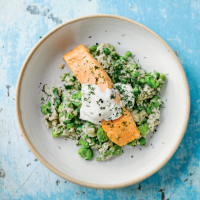 Cook the pea and asparagus risotto according to pack instructions. Stir in the beans, 1 tbsp crème fraîche and most of the dill. Serve topped with the fish, remaining crème fraîche and dill.